CP ALL Public Company Limited recognizes the importance of energy use as it is related to business operations as well as the daily life of consumers. No less important, energy use has an impact on the environment and climate change. We are committed to taking part in minimizing the aforementioned impact by supporting and driving different units in the organization to improve energy efficiency in their unit and business activities, and promoting the careful use of natural resources for the greatest productivity. We also promote the development of new innovations or measures to reduce overall energy use, the increased use of renewable energy and clean energy, and low carbon activities. Due to our continued efforts in this area, numerous energy conservation projects have been initiated and implemented. 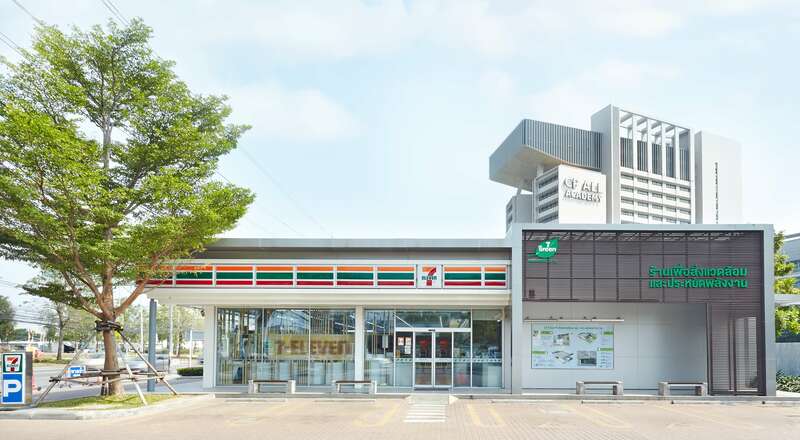 The 7-Eleven store at Tara Square on Chaengwattana Road is the first convenience store in Thailand and ASEAN to receive the TREES Platinum Green Building Rating, the highest rating from the Thai Green Building Institute (TGBI) according to the Thai’s Rating of Energy and Environmental Sustainability (TREES) standards. TREES standards cover building design, construction and management; layout plan and landscape; water, energy and air conservation; construction materials and resources; indoor environmental quality; prevention of environmental impact; store equipment; and other innovations. 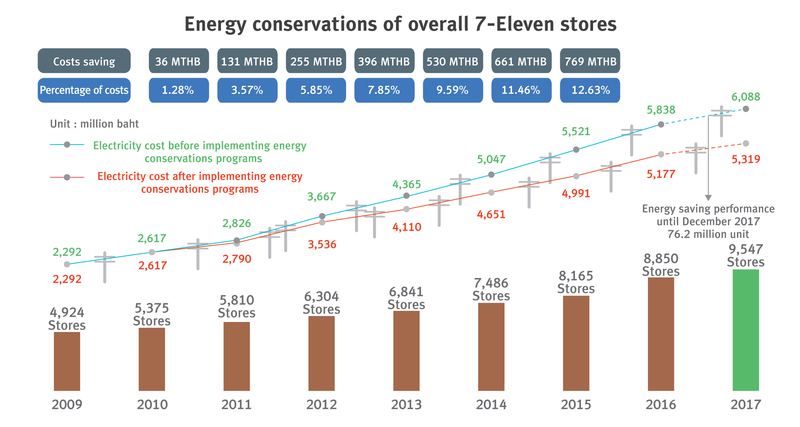 The Tara Square 7-Eleven store is the first and only convenience store in Thailand to receive certification for successfully meeting the requirements of the Carbon Footprint Label Scheme from the Thailand Greenhouse Gas Management Organization (Public Organization) in September 2014. The Tara Square 7-Eleven store had total carbon emissions of 516 kg/year from its activities. The Company recognizes the importance of the country’s greenhouse gases reduction policy according to the National Climate Change Master Plan which states reduction of CO2 emissions in the range of 7-20 percent in 2020 as well as support for domestic voluntary carbon market. Thus, the Company nominated the Tara Square 7-Eleven store to participate in the Carbon Footprint for Organization Program as well as the Carbon Offsetting Program. The Tara Square 7-Eleven store offset a total of 167 tons of CO2 emissions. Due to the success of the design and operation of the Tara Square 7-Eleven store, which was the prototype of an energy-efficient convenience store in 2016, energy saving measures that are suitable and feasible with 7-Eleven stores have been replicated and implemented in other branches, both due for renovation and due to be opened, across the country. In 2017, the Satit PIM branch was opened as a new convenience store format. The store was designed to be environmentally friendly and even more energy-efficient through the application of modern technology, innovations, and a variety of management approaches to promote efficient energy management. These approaches include, among others, good store planning, eliminating unnecessary energy loss, and the of use LED lights for all screens and lighting in the store. The store also has a customer purchase behavior assessment system to improve the efficiency and planning of resource consumption. In addition, a real-time energy consumption system monitors and analyzes electricity consumption on daily basis. Moreover, the Company further built on the Tara Square prototype store by designing services and management approach that benefits the community and society according to the principle of CCC: Convenience Community Center. Community Digital Touchscreen is provided to enable information exchange. There is a robotic innovation, Sevy Bot, an artificial intelligence assistant that can communicate with customers via visuals and texts through a motion detection sensor. Sevy Bot can communicate with customers in close proximity and move around the shop throughout the day without batteries. Sevy Bot may be further developed as a part of service in other branches in order to improve service. This innovation is the work of students from the Engineering and Technology Faculty, Robotic Engineering and Automatic System Major, Panyapiwat Institute of Management (PIM). 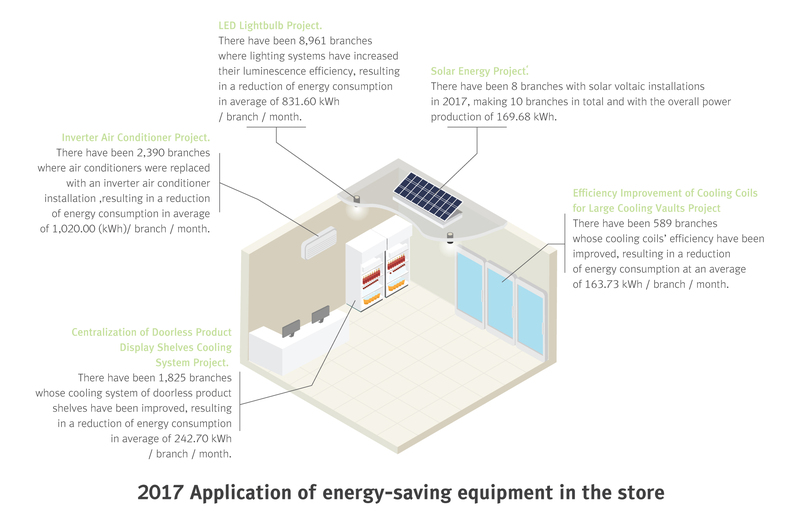 The energy conservation program by applying energy saving equipment in 7-Eleven stores is summarized below. From the energy conservation projects, the Company has been able to reduce energy consumption by 12.63%, or equivalent to Baht 769 million, as illustrated in the following diagram. Furthermore, there are other energy conservation projects in which the Company reduces its environmental impacts and promotes environmental quality. Smart Bike Parking Public bike service, equipped with smart locks that customers can unlock, rent and pay for via mobile phones, is a campaign to reduce personal vehicle use. Electric Car Power Stations support the rising trend of electric cars in the future and help familiarize consumers with electric cars. Installation of Water-Saving Sanitary Ware The Company selects water saving sanitary ware with 2 capacity levels, 3 and 4.5 Liters, which can reduce water consumption by 12.5% compared to the 3/6 Liter type. The Company incorporates Leadership in Energy & Environmental Design (LEED), one of the most internationally recognized standards, in the development and design of distribution centers across the country, in addition to applying for certification from the United States Green Building Council (USGBC). Currently, the Mahachai and Chonburi distribution centers have been certified. As for the Buriram distribution center, it is in the process of applying for Thai’s Rating of Energy and Environmental Sustainability (TREES), which is a certificate issued by Thailand’s Green Building Institute. Under the corporate Energy Management Plan, distribution centers across the country are considering energy-saving and renewable energy measures that are appropriate to the business operation, such as the installation of a heat transferring system to reuse excess heat in distribution center operations in Bangbuathong, Suvarnabhumi, Mahachai, Khon Khaen, Phuket and Chonburi. There are also plans to use renewable energy in distribution centers across the country. For the initial phase, the Company has installed photovoltaic panels on the rooftop of a temperature-controlled distribution center in Suvarnabhumi. For transportation and distribution of products, the Company is committed to uphold energy management as a priority through the Reduction of Pollution from Product Transportation Project, managing the reduction in transportation time. As of 2017, the Company has improved the process of inventory stocking at 7-Eleven stores nationwide. Previously, inventory checking was done during delivery of products at each store. Now, the incoming inventory checking is conducted at the distribution center and uses the ‘Trust’ system, whereby 7-Eleven stores trust the precision and accuracy of inventory checking done by other departments in the Company. This improvement has reduced the fuel consumption and pollution generated from leaving the vehicle on for the temperature-controlled storage, which is necessary while waiting for the inventory stocking process at each 7-Eleven store. The aforementioned process helps reduce the product transportation time in the store’s vicinity, currently approximately 15 minutes from 45 minutes, resulting in the reduction of diesel consumption by 83,950 liters per year, reduction of greenhouse gas emission by 230 carbon dioxide tons per year, and reduction of paper consumption or deforestation by 7,656 trees per year.